This Mortar and Pestle, crafted in Black Marble, is an essential in any kitchen. Much bigger than its Mini brother, its ideal when you need bigger quantitys. A member of the Marbleart range, and presented in a handy box. 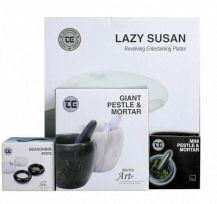 The Marbleart range comes in a smart presentation box; great gifts for the cook .... and their helpers! Marble is a completely natural material, therefore each piece is unique in colour and veining. Presented in a coloured gift box, this pestle & mortar is part of T&G's smart, elegant collection of products made from solid marble, in the Marbleart range. T&G have been successfully, both designing and selling, house-wares products in the UK since 1975 and have literally millions of satisfied customers worldwide. All T&G’s products are exclusively designed and tested for superior function and quality.